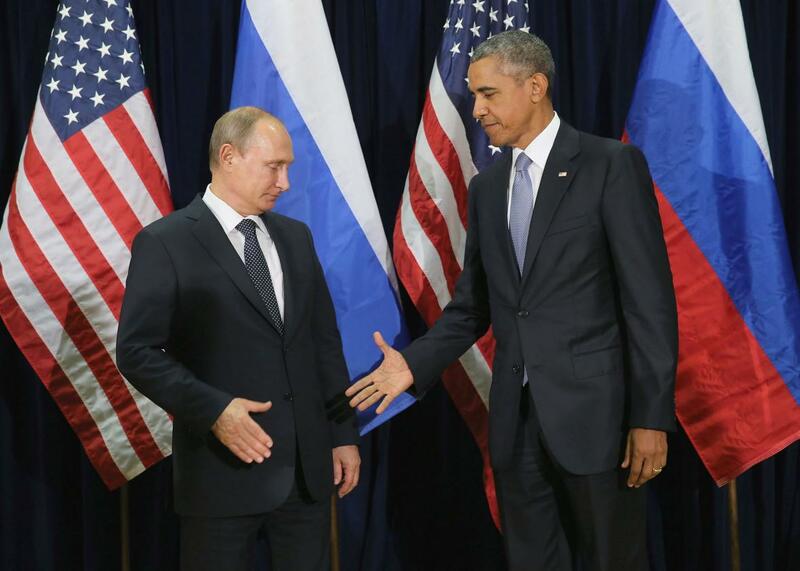 Russia Begins Bombing Campaign in Syria to Support Assad and Antagonize the U.S.
Russian President Vladimir Putin (L) and U.S. President Barack Obama shake hands for the cameras before the start of a bilateral meeting at the United Nations headquarters September 28, 2015 in New York City. After weeks of build-up, Russia has begun its military offensive in Syria with airstrikes in rebel-controlled areas in Homs and Hama provinces. Russian defense officials say that about 20 airstrikes hit ISIS targets. However, U.S. officials say the location of the strikes—far from ISIS-controlled territory—makes that unlikely, and initial reports on the ground suggest that the strikes were targeted at groups affiliated with the Free Syrian Army, the main umbrella group for relatively secular rebels fighting against Bashar al-Assad’s government, who have received some U.S. support. This confirms widespread suspicions over the past couple weeks that Russia’s military build-up in Syria is aimed more at protecting Assad—from all enemies—rather than going after ISIS in particular. U.S. and Israeli officials were especially alarmed by Russia’s deployment of anti-aircraft systems, given that ISIS doesn’t have any planes. Today’s events seem to prove the skeptics right. Russia reportedly gave the U.S. an hour’s notice about the strikes and response from Washington was mixed: Defense Secretary Ashton Carter said “I take the Russians at their word” about their intentions with the airstrikes; Secretary of State John Kerry tweeted that the U.S. would have “grave concerns” if it turned out the strikes took place where ISIS was not operating. Despite devoting their respective speeches at the United Nations on Monday to refuting each other’s worldviews, Obama and Putin held a meeting on Monday, raising hopes that there could be cooperation between the two powers to help bring an end to the conflict in Syria, even if it meant tolerating a future role for Assad in the government. That era of relatively good feelings lasted about a day.